Here's the (nearly) finished vacuum former! Although there are a couple of fixes & improvements to be made, it's complete enough to start pulling parts. Spacers added to the frame near the handles. Spacers provide a tighter fit to the vertical guides. I added some guides to the frame in order to more accurately guide the frame between the heater box and the vacuum platen. Now the frame lands perfectly around the platen every time. I also added a latch to the frame so that I can quickly load it with styrene and lock it down with an air tight seal. The position of the eye bolt & wing nut are just outside the spacing of the heater box so I don't get any interference in either the heater or vacuum positions. And, the 12" x 16" size of the frame let's me cut up a variety of standard stock sizes without any waste: 12" x 48", 2' x 4', or 4' x 8'. The final addition to the frame are the magnetic holds. 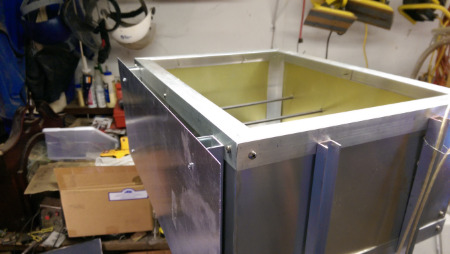 I epoxied 12 neodymium magnets around the frame and another 12 embedded into the heater box. 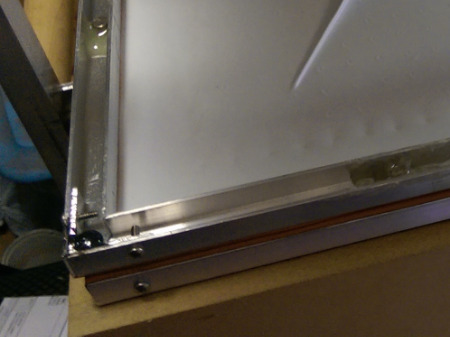 This holds the frame against the box in the upper position while the plastic heats. When it's ready, I pull the frame away from the magnets and slide it down over the platen where the vacuum pulls the pliable plastic around the pattern forms. This part of the former gave me the most trouble. First, I ended up needing more magnets than I anticipated. And handling the epoxy required developing a reliable procedure. I started with the J-B Weld, assuming that my prior success with the wooden to metal offsets would mean quick and easy success with magnets. Nope! It's messy and the fine control I needed to position the magnets in the frame required longer than the very short setup time. And later, one of the magnets pulled away from the frame. So, I went back to my more familiar 5 minute epoxy, and it still took awhile to figure out how to effectively position the magnets, and find tools that weren't subject to magnetic forces! I also ended up drilling mounting holes in the heat box, partially to give better epoxy mounting, but to also bring the magnets from the heater box closer to the magnets from the frame, without the aluminum box frame getting in the way. I finally got everything mounted and working, but it's ugly and I still have one magnet that needs to be reinstalled. At this point, I had completed enough to try vacuum forming. I had tested the heater and vacuum wiring a bunch of times & it always worked. So, I put my 1st piece of plastic in, moved the frame up to the magnetic hold position against the heater box, placed the sample pattern forms, turned on the heater and watched the plastic heat & droop. 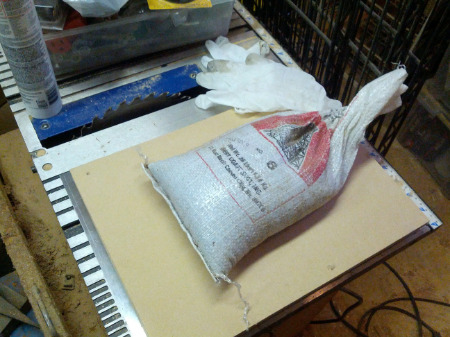 Once it looked ready, I quickly dropped it over the forms and platen and then switched from the heater to the vacuum. I tried the switch several times and the vacuum never came on. So I tossed out that piece of plastic and began troubleshooting the problem. After ringing out the fuse and wiring, I finally found out that the switch had fried! Luckily, I was able to find another 3 position, high current switch at a local Radio Shack, and was able to replace it the same day. Then I did another test. I grabbed a spray can lid and an abalone shell that I happened to have in my shop. They were sturdy enough and heat resistant enough to be good forms, and the vertical lines of the lid would be a good test of a tall, straight part. Also, the lid has raised lettering, and I can see how well the form would pick up detail. The 0.03 styrene successfully vacuum formed! And it worked! The plastic heated and became pliable after a minute or two. I saw the characteristic droop, and then dropped the plastic down onto the forms. I quickly threw the switch from the heating to the vacuum position, and the plastic was pushed down to form over the patterns. There was some webbing (those vertical fin-like pieces that branch off from the lid with one running over to the shell), and the shell had some overhang which locked the shell into the plastic. I was able to work the shell out, and the lid popped out pretty easily. I cut out the two pieces and cut off some of the webbing although I didn't meticulously clean up the pieces. Still, they came out very nicely for my first vacuum forming. Two more components were added to the build before I stopped for the day. First, I added stand off feet to the bottom of the vacuum box. I used the 4 feet that came with the toaster oven I had dismantled. The feet were necessary to lift the vacuum box off of the table. When the vacuum former is standing upright and without the feet, the lower box forms a seal with the table, and the out flow of air from the shop van when it's turned on causes the box to lift up off of the table like a hovercraft. Until I added the feet, I had to place spare boards under the corners of the box to give the airflow an exit path. Finally, I placed a protective face onto the heater box in order to shield the operator from the 110 V going to the heater elements. I only did the one face, but intend to place an aluminum facade over the additional 3 sides later. And that's it for now. The following open items aren't critical, so I'm going to set this project aside so that I can get come other projects done, and so that I can use the vacuum former to make some props! 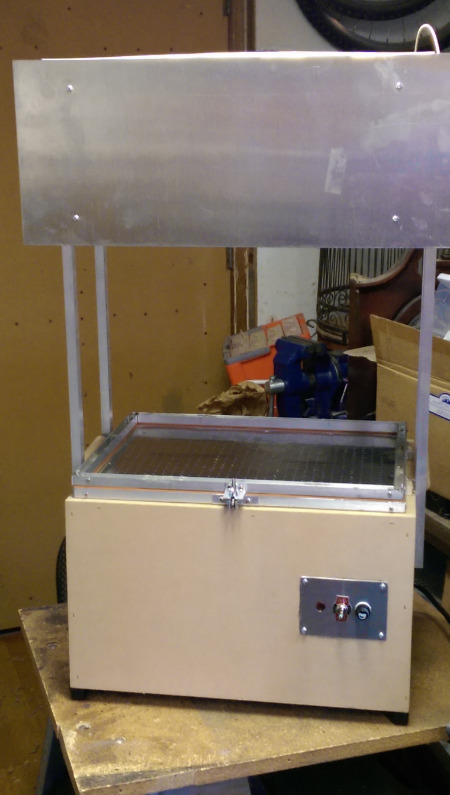 Today I mounted the platen to the vacuum chamber and finished the wiring. To attach the platen to the vacuum chamber, I first thought about using J-B Weld. However, I like being able to disassemble a piece of equipment for repairs, so I decided to screw the aluminum plate down to the wooden support. I put a screw in every 4 inches or so and it seems to be holding securely. I'll see whether it's air tight enough when I try to vacuum form something. I finally got to the wiring today. Everything went together well once I found my soldering setup. I only needed to solder a couple of leads to the fuse holder. Everything else is attached with high temperature twist nuts. I wired in the shop vac first, and that worked great. Then I wired the heating elements and discovered that the pilot lamp doesn't work (I probably damaged it when removing it from the toaster oven), and that wiring all the heating elements in series doesn't generate enough heat. I rewired so that two heating elements each are wired in series. 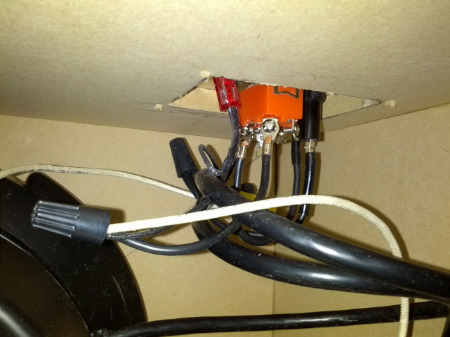 Then the two pairs of heating elements are wired in parallel to the power switch. That worked much better so that the heating elements warm up very quickly. An unexpected advantage to regularly posting updates is that I review my activities in a more detailed way. And so, when working on yesterday's post, I realized that I had glued the spacers on the wrong side of the platen! I rushed out to confirm my mistake, and sure enough, I had glued onto the working surface. Luckily, it turned out that the adhesive I used was terrible, and so the spacers fell right off. So today, I cleaned off the glue residue from the platen, made some new spacers, and researched a good adhesive for attaching wood to metal. In the process, I discovered a great site called ThisToThat. You can put in two materials and it will recommend several appropriate adhesives. Between that site and some other prop building forums, the overall consensus was that J-B Weld was the right glue for the job. I picked some up today and it is an epoxy. It comes in two tubes, one is labeled Steel and the other is Hardener. It's mixed in equal parts, however the result is much thicker than other epoxy I've used. It makes it harder to spread and so the application took much longer than I anticipated. Flattening the platen and applying pressure to the spacers while the epoxy cured. I use shot for adding weighing to tool handles and playing pieces, and the bag of shot weighs a good 10 to 15 lbs. This is perfect for clamping down the wooden support spacers to the platen. The power cord to the shop vac is long, so I cut it in order to wire the vac into the controls and to provide the power cord for the entire vacuum former. While that cured, I started work on the wiring. I cut the holes for the controls (fuse, pilot light, and 3 position toggle switch) and cut up the power and vacuum cables. I didn't get very far before I discovered some missing tools and decided to call it a night. So, most of today was spent recovering from yesterday's mistake. I'll get back to working on the wiring in a couple of days.